The National Weather Service has issued a Flood Watch for portions of Western Washington including Mason, Grays Harbor, Jefferson, Lewis, Pierce, and Thurston counties. The Flood Watch is effective from Friday afternoon through Saturday afternoon. 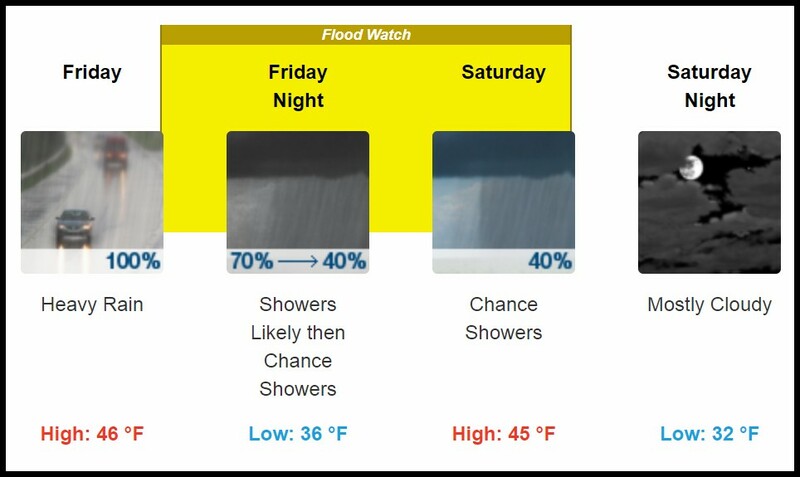 Forecasters expect heavy rain at times in the mountains today through Friday which could cause minor flooding on a few rivers in Western Washington. The snow level will rise to as high as 5000 feet over southern areas on Friday. Heavy rain will end Friday night as a cold front moves through the region. Rivers will crest, a few near flood stage, on Friday night or Saturday. There is a chance of minor flooding on a few of the most flood prone rivers. These rivers include the Skokomish River in Mason County and the Newaukum River in Lewis County.